اسلامی, اکبر, یزدانبخش, احمدرضا, دارایی, هیوا, صوفی کریمی, فاطمه. (1393). حذف 4- کلروفنل از محیط‌های آبی با استفاده از جاذب نانوساختار اکسید گرافن. مجله آب و فاضلاب, 26(1), 19-26. اکبر اسلامی; احمدرضا یزدانبخش; هیوا دارایی; فاطمه صوفی کریمی. "حذف 4- کلروفنل از محیط‌های آبی با استفاده از جاذب نانوساختار اکسید گرافن". مجله آب و فاضلاب, 26, 1, 1393, 19-26. اسلامی, اکبر, یزدانبخش, احمدرضا, دارایی, هیوا, صوفی کریمی, فاطمه. (1393). 'حذف 4- کلروفنل از محیط‌های آبی با استفاده از جاذب نانوساختار اکسید گرافن', مجله آب و فاضلاب, 26(1), pp. 19-26. اسلامی, اکبر, یزدانبخش, احمدرضا, دارایی, هیوا, صوفی کریمی, فاطمه. حذف 4- کلروفنل از محیط‌های آبی با استفاده از جاذب نانوساختار اکسید گرافن. مجله آب و فاضلاب, 1393; 26(1): 19-26. در این تحقیق اکسید گرافن به‌عنوان یک جاذب نانو ساختار با خواص بهتری نسبت به سایر جاذب‌ها برای حذف 4-کلروفنل از محیط آبی مورد بررسی قرار گرفت. اکسید گرافن با روش هامر سنتز شد. برای شناسایی مورفولوژی و ساختار جاذب از روش‌های پراش‌سنجی پرتو ایکس و تصویر میکروسکوپ پراش الکترونیکی استفاده شد. متغیرهای مؤثر بر فرایند جذب از جمله غلظت اولیه 4-کلرو فنل، مقدار جاذب و pH به‌روش تغییر یک عامل در زمان بررسی شد. در انتها داده‌ها با ایزوترم‌های لانگمیر و فروندلیچ مطابقت داده شد. فرایند جذب در زمان 20 دقیقه به تعادل رسید. 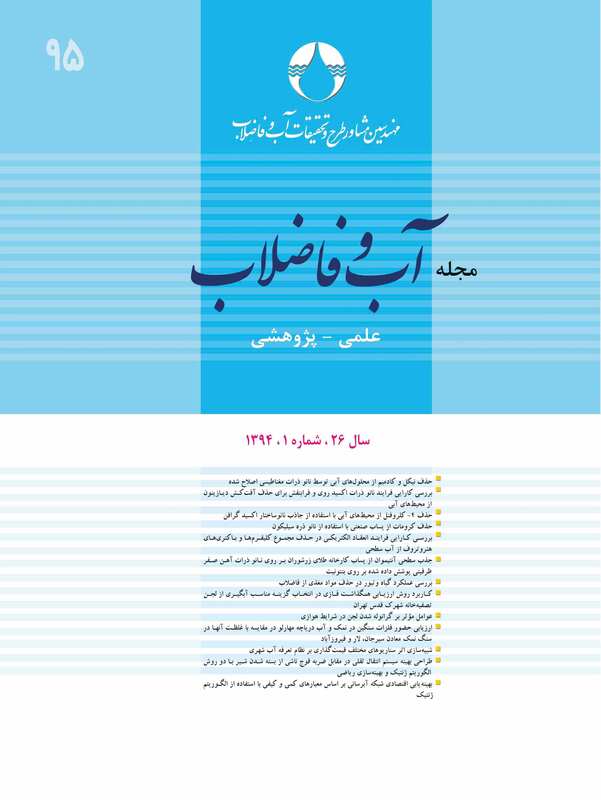 مقدار 4/0گرم در لیتر اکسید گرافن در زمان 5 دقیقه و pH برابر 8 توانست 10 میلی‌گرم در لیتر 4-کلروفنل را تا90 درصد حذف نماید. ایزوترم لانگمیر، فرایند جذب را به‌خوبی توصیف نمود. مقدارR2 معادل 99/0و RL برابر با 34/0 به‌دست آمد.فرایند جذب به‌وسیله جاذب اکسید گرافن از فرایندهای ارزان قیمت با راندمان بالا است و می‌توان از آن در کاهش و از بین بردن آلاینده‌های محیطی و ‌به‌ویژه محیط‌های آبی استفاده نمود. In this study, graphene oxide was used as a nanostructured adsorbent with properties supposedly better than other common adsorbents to remove 4-chlorophenol from aqueous solutions. For this purpose, graphene oxide was initially synthesized using the Hummer's method and x-ray diffraction and scanning electron microscopy were employed to identify its morphology and structure. The variables involved in the absorption process (including 4-chlorophenol initial concentration, adsorbent dosage, and pH) were investigated based on the one-factor-at-a-time method. Eventually, the data were confirmed against the Langmuir and Freundlich isotherms. It was found that the adsorption process reached equilibrium in 20 minutes. A dosage of 0.4 g/L graphene oxide at pH=8 brought about 90% removal of 10 mg/L 4-chlorophenol within 5 minutes. The adsorption isotherm was described well by the Langmuir isotherm model and the values for R2 and RL were recorded as 0.99 for and 0.34, respectively. Being a low cost and highly efficient process, the adsorption process using graphene oxide adsorbent may be recommended for the reduction and elimination of pollutants in the environment, especially those in aqueous solutions. 3. Sawyer, C. N., McCarty, P. L., and Parkin, G. E. (2000). Chemistry for environmental engineering, 4th Ed., New Tata McGraw-Hill, Dehli. 4. WHO. (1987-1989). International program on chemical, environmental health criteria 93, Chlorophenols other than Pentachlorophenol, Geneva. 5. Ren, y., Yan, N., Wen, Q., Fan, Zh., Wei, T., Zhang, M., and Ma, J. (2010). “Graphene/MnO2 composite as adsorbent for the removal of nickel ions from wastewater.” Chemical Engineering Journal; doi: 10.016/j.cej. 2010.08.010. 6. Danis, T. G., Albanis, T. A., Petrakis, D. E., and Pomonis, P. J. (1998). “Removal of chlorinated phenols from aqueous solutions by adsorption on alumina pillared clays and mesoporous alumina aluminum phosphates.” Water Research, (32), 295-302. 7. Can Izares, P., Lobato, J., Paz, R., Rodrigo M., and Sacez, C. (2005). “Electrochemical oxidation of phenolic wastes with boron-doped diamond anodes.” Water Research, 39, 2687-2703. 4-chlorophenol in aqueous media.” Ultrasonicssonochemistry, 15, 981-987. 9. Satuf, M.L., Brandi, R.J., Cassano, A.E., and Alfano, O.M. (2007). “Scaling-up of slurry reactors for the photocatalytic degradation of 4-Chlorophenol.” Catalysis Today, 129, 110-117. 10. Sheela, T., Arthoba Nayaka, Y., Viswanatha, R., Basavanna, S., and Venkatesha,T.G.(2012). “Thermodynamics studies on the adsorption of Zn (II), Cd (II) and Hg (II) from aqueous solution using zinc oxide nanoparticles.” Powder Technology, 217, 163-170. 11. Sungjin, P., and Rodney,S.R.(2010). “Chemical methods for the production of graphenes.” <<http://Www.Nature.Com/Naturenanotechnology.>> (Sep. 2013). 12. Ramaprabhu, S., and Mishra, A.(2011). “Functionalized graphene sheets for arsenic removal and desalination of sea water.” Desalination, 282, 39-45. 13. Yang, Sh. T., Chang, Y., Wang, H., Liu, G., Chen, Sh., Wang, Y., Liu, Y., and Cao, A. (2010). “Folding/aggregation of graphene oxide and its application in Cu2+ removal yang.” J. of Colloid and Interface Science, 351, 122-127. 14. Deng, X., Lu, L., Li, H., and Luo, F. (2010). “The adsorption properties of Pb(II) and Cd(II) on functionalized grapheneprepared by electrolysis method.” J. of Hazardous Materials, 183, 923-930. 15. Zhang, K., Dwivedi, V., Chi, C., and Wu, J. (2010). Graphene oxide/ferric hydroxide composites for efficient arsenate removal from drinking water.” J. of Hazardous Materials, 182, 162-168. 16. APHA, AWWA, WEF. (2005). Standard metods for the examination of water and wastewater, 20th Ed., Washington DC. 17. William, S., Hummers, Jr., and Offeman, R.E. (1958). “Preparation of graphitic oxide.” Journal of American Chemical Society, 80(6), 1339-1339. 19. Zhou, W. (2005). “What does tme tell us about mesoporous silicas.” Stud. Surf. Sci. Catal., 140, 525-535. 20. Karthikeyan, G., and Ilango, S. S. (2007). “Fluoride sorption using morringa indica-based activated carbon.” Iran. J. Environ. Health. Sci. Eng., 4, 21-28. 21. Mishra, A. K., and Ramaprabhu, S. (2011). “Functionalized graphene sheets for arsenic removal and desalination of sea water.” Desalination, 282, 39-45. 22. Li, L., Fan, L., Sun, M., Qiu, H., Li, X., Duan, H., and Luo, Ch. (2013). Adsorbent for chromium removal based on graphene oxide functionalized with magnetic cyclodextrin–chitosan.” Colloids and Surfaces B: Biointerfaces, 107, 76-83. 23. Deng, J. H., Zhang, X. R., Zeng, G.M., Gong, J.L., Niu, Q. Y., and Liang, (2013). “Simultaneous removal of Cd(II) and ionic dyes from aqueous solution using magnetic graphene oxide nanocomposite as an adsorbent.” Chemical Engineering Journal, 226,189-200. 24. Houg Huang, Z., Zhang, X., Lv, W., Wang, M., Yang, Q-H, and Kang, F. (2011). “Adsorption of lead(Ii) ions from aqueous solution on low_temperature exfoliated grapheme nanosheets.” Langmuir, 27, 7558-7562. 25. Kuleyin, A. (2007). “Removal of phenol and 4-chlorophenol by surfactant-modified natural zeolite.” J. of Hazardous Materials, 144, 307-315. 27. Kashif, N., and Ouyang, F. (2009). “Parameters effect on heterogeneous photocatalysed defradation of phenol in aqueous dispersion of TiO2.” J. of Environmental Sciences, 21(4), 527-533. 28. Khatirvelu, S., and Louis, D. (2009). UV protection finishing of textiles using ZnO nanoparticles.” Indian Journal of Fibre and Textile Research, 34, 267-273. 29. AWWA. (1990). Water quality and treatment: Handbook of community water supplies, Technical Edited by Potius FW, 4th Ed., McGraw-Hill, Inc. Washington DC. 30. Cruz, C.C.V., Costa, A.C.A., and Henriques, C.A. (2004). “Luna AS kinetic modeling and equilibrium. “Studies during cadmium biosorption by dead sargassum Sp. biomass.” Bioresour. Technol., 91, 249-257. 31. Hameed, B., Ahmad, A., and Aziz, N. (2007). “Isotherms, kinetics and thermodynamics of acid dye adsorption on activated palm Ash.” Chemical Engineering Journal, 133(13), 195-203. 32. Eckenfelder. (2000). Industrial water pollution control.” 3rd Ed., McGraw Hill, Washington, D.C.
33. Song, X., Cheng, X., Yang, X., Li, D., and Linghu, R. (2008). “Correlation between the bond dissociation energies and impact sensitivities in nitramine and polynitro benzoate molecules with polynitro alkyl groupings.” J. of Hazardous Materials, 150(2), 317-321. 34. Crittenden, J.C., Trussell, R.R., Hand, D.W., Howe, K.J., and Techbanoglous, G. (2005). Water treatment: Principal and design, 2nd Ed., Hoboken, John Wiley and Son, New York. 35. Langmuir,I.(1918). “The adsorption of gases on plane surfaces of glass, mica andplatinum.”J. of theAmerican Chemical Society, 40, 1403-1361. 36. Langmuir, I. (1916). “The constitution and fundamental properties of solids and liquids.” J. Am. Chem. Soc., 38, (11), 2221-2295.